Exclaimer Cloud - Signatures for Office 365 was chosen by the Movember Foundation to centrally manage its Office 365 signatures so it could move away from Transport Rules. 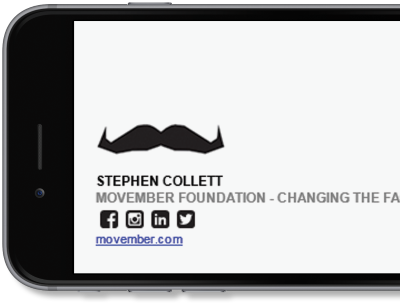 The Movember Foundation is the only charity tackling men’s health on a global scale, year round. It has one goal: to stop men dying too young. By 2030, it will reduce the number of men dying prematurely by 25%. The Foundation funds game-changing men’s health projects. Millions have joined the movement, allowing it to fund over 1,200 projects focusing on prostate cancer, testicular cancer, mental health and suicide prevention. In addition, its Awareness and Education program is encouraging men to become more aware of their health, to talk about the big stuff in life, and take action when health issues arise. The product works really well and has solved the headache of managing and trying to maintain consistent email signatures. In the modern business world, an organization is expected to have a professional email signature that has brand consistency, a compliant legal disclaimer, dynamic marketing content and will work across multiple web-enabled devices. However, IT departments often find the implementation of Office 365 Transport Rules for email signature management problematic, especially when more than one rule is required. If you are interested in having Exclaimer publish your own success stories, please contact the Exclaimer Marketing team below.